ECサイトの売上と利益を伸ばす Increase Sales and profits of the E-commerce website. : Looking closely at vertical and horizontal axes of customers to find the way to increase sales. Increase Sales and profits of the E-commerce website. Home » Sales analysis » Looking closely at vertical and horizontal axes of customers to find the way to increase sales. Looking closely at vertical and horizontal axes of customers to find the way to increase sales. On the previous article, I wrote "you can find a clue to improve sales by looking at purchase tendency and buying psychology of your customers". In this article, I'd like to go into this topic. How do you create profiles of your customers? Do you have clear profiles of your existing customers? When I ask these questions to my clients, for the most of time, I receive answers like these. "Women in their late teens and early twenties." "Female office workers in their late twenties and thirties." "Housewives in their late twenties, thirties and forties." Now, I want you to ask yourself these questions. Haven't you thought just like them and convinced yourself? This kind of profiling is probably needed when you place advert. But, if you add a little more information on these customer profiles, then you can have not only clear ideas of customers but also think up what you should sell for the next. "Woman aged 37: she purchased underwear four times, but she shops only when free shipping is on. Her average order unit price is \2,980." "Woman aged 23: each time she purchases three or four, low-price & bright colour tops with some patterns on. Her average order unit price is \4,750." "Woman aged 32: she purchased roll cakes that richly filled with double cream at 70% possibility in the past. Once she liked a product, she tends to keep buying the same product every time. Her average order unit price is \2,400." "Woman aged 27: she purchase the same skincare product for once in three months. She also added items related to good sleep at recent two purchase. At this point, it comes to important to check "vertical and horizontal axes of customers". By examining these two factors, you can definitely increase sales. The vertical axis is a record of a customer's purchase from the past to the most recent. And the horizontal axis shows what kind of products the customer bought together at each shopping. In fact, by looking closely at the relation of these two lines, you can make a clear profile of your customer. And if you have solid profiles of your customers, it will be easier for you to structure what you should offer them next. Now, here is the process of profiling. 1. Sum up the order data of your customers. Using Excel is a good and easy way to make your calculation on each customer. 2. 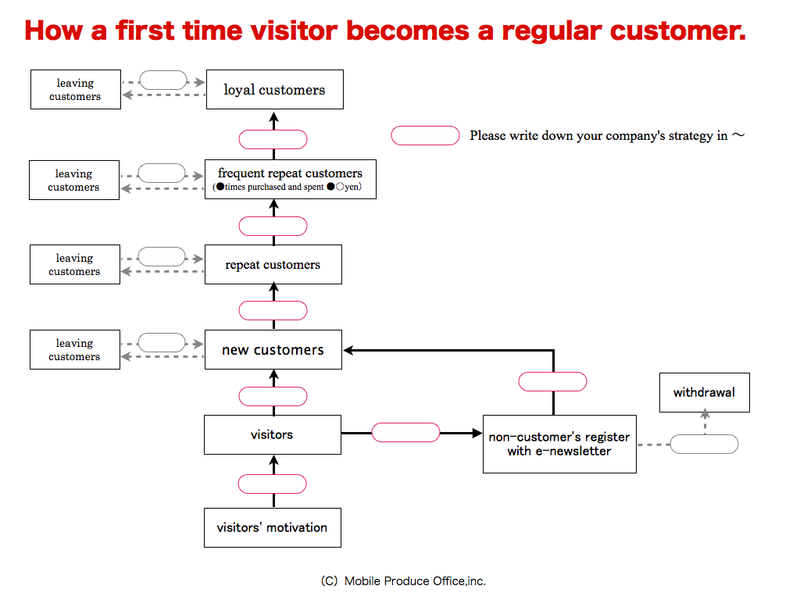 Categorize your customers into "new customers", "repeat customers" and "regular customers", then examine each category. 3. After categorized your customers, you can study them like these examples. "This customer has shopped four times but only bought products with free shipping." "This person always purchased clothes with patterns on". "This customer is hooked on anything tagged "melting". "This customer purchase items in similar colors every time. "This customer shops only once in a year but every time spends more than 100,000 yen". "There are repeat customers for product A and B". Once you find out these facts, then you can ask yourself these questions to picture your customers. "Why this person buys this particular product?" "What kind of person bought this product? Furthermore, you can also think about these questions to enhance your business opportunities. "What did this person purchase before and after that time of shopping?" "What else did this person buy at that time of shopping?" "I found a trend in my customers' purchase. Then, what is the probability?" This method may take time at the beginning; however, it allows you to visualize your target customers clearer and gives you inspirations for what to develop or what to buy in next. Moreover, if you have particular types of customers for sale items, then you can offer them their favorite types of sale in order to cut down sale cost. In the other way around, you can offer exclusive items preferentially to your regular customers who are highly possible to buy the items. And this will help you to keep your customers attracted to your shop. Actually, the comment I receive most from my clients is "We could come up with new business ideas that do not require us high cost promotions such as free-shipping and discount." Because of the highly competitive situation they are in, companies entered into large shopping malls tend to believe that they need to hold sale to attract customers. Indeed, it is true, however, it is also possible to increase sales without having sale. When you think about ideas for e-newsletters or monthly promotions, I strongly recommend you to analyze your customers. By doing so, you will find yourself coming up with huge amount of ideas. Since it doesn't cost you for advert or anything, why don't you try it today? Previously, we made use of order data. Now, we can add them customer profiles to picture more solid images of target customers. Types of profile data are varied in each e-commerce website. Some websites pick up information such as age, date of birth, and occupation but others collect no personal information at all. Either way, you can make an analysis from products your customers purchased. The worst thing to do is to compromise with ambiguous ideas like "a female office worker in her twenties". There is a process that your customer goes through: he/she starts as "a new customer" then becomes "a repeat customer" and finally she/he shifts to your "regular customer". You can illustrate this process and consider the way to promote your customers from "new" to "repeat" customers, and what to do to make your repeat customers regular customers. I attached a chart for your reference. I hope it would help you to revisit your company's case. I'm going to write about the method later on, but firstly I recommend you to think about it on your own way. Let's sales analysis of your e-commerce website in this item at least once a week. Chase the whereabouts of coupons distributed. For effect measurement and analysis of sales discount sale. （C）Noritsugu Iwamizu. Powered by Blogger.